Although the author has made every reasonable attempt at historical accuracy according to the best of his ability to recall past events, this vignette is a work of memory, and as such, some details, such as quotations, may not agree with historical fact. Brrriiiiing. "Good morning; welcome to our humble abode." Gianmarco holds open the door as Kade, David, Laura, and Brandon shuffle through. Chris had taken Andrew to the train station around 7. We in the small apartment had bid our farewells the night before, but Andrew had woken up each person in the big apartment that morning before he left. The responses he got were less than bright-eyed and bushy-tailed enthusiasm. It is a little after 8:45 now. The plan is to leave at 9:45 for our appointment with Thiemo at 10. As people in the big house start waking up, we all start pitching in to make our meal, but it is a slow morning, and although we all snag some toast here, some watermelon there, maybe a glass of OJ and a sunny-side egg, the extravagence of our plans start to far outstrip the time we have. Chris calls out ten minutes to departure time, five minutes, three minutes, and it is increasingly apparent that we will simply have to altogether abandon our dreams of sitting down all together. Although we had a scarcity of time, we had a surplus of eggs. We had 34 eggs, in fact. This apparently came as a result of repeatedly forgetting how many eggs we really had each time we went to the grocery store, and saying, oh, what a great idea it would be to buy eggs so that Gianmarco can continue to make them for breakfast. In actuality, Gianmarco hadn't cooked us eggs for breakfast for nearly a week now. We would more than make up for this deficiency by cooking a tremendous batch of scrambled eggs. Onions were sauteed, spices pinched, the whole nine yards gone—maybe even the kitchen sink thrown in. But our magnum opus never came to fruition: it was too large to cook quickly enough, and the order was handed down from high to dispose of the concoction. Laura, David, Brandon, and I jumped into our car. We were going to meet Thiemo on time and begin our lessons with him, while the residents of the big apartment packed and cleaned. They joined us fifteen minutes late. 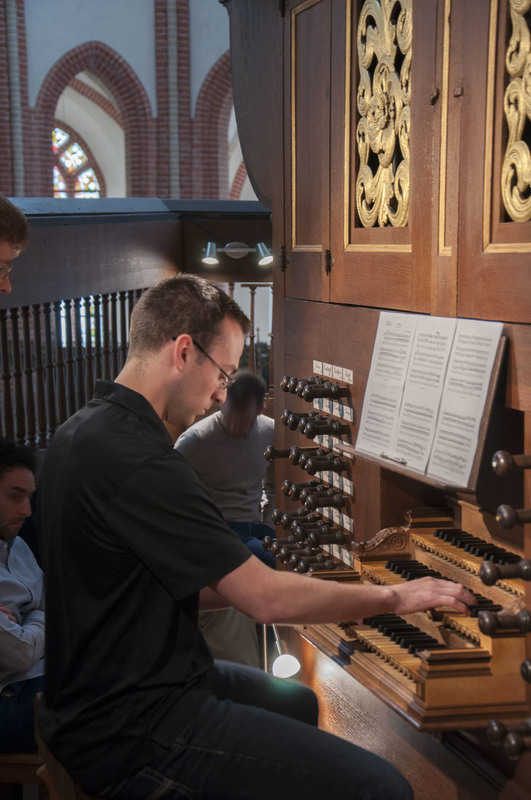 Noel is coached by Thiemo on the Schnitger organ. 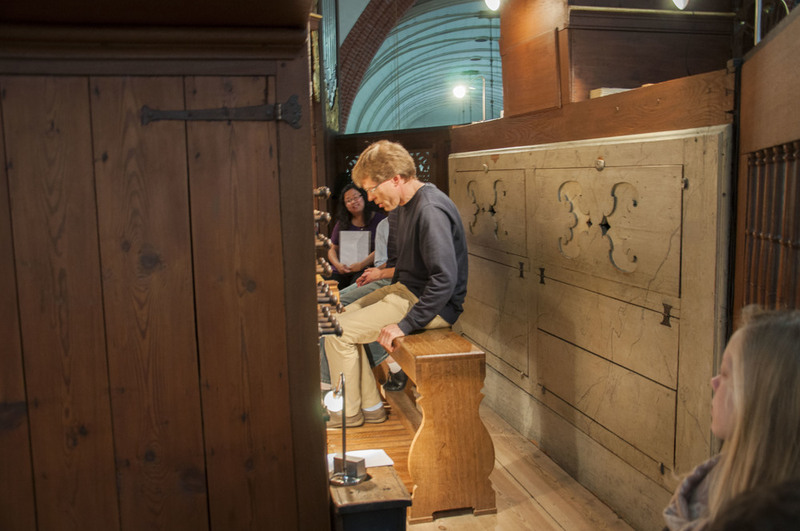 We were back on the Schnitger organ in the Ludgerikirche, and our work with Thiemo was great. His sense of humor is fabulous and the delivery of his jokes is dry. Once we had all been on the bench, we bought some CDs, took our customary photo with our host, and gave a round of thanks and handshakes. Thiemo recommended an Italian place down the street for lunch that Brandon had been eyeing. It was on the two minute walk there that I was volunteered to write this post, and even in retrospect I'm not entirely sure how it happened. The food was good, and although we refused to discuss our favorite parts of the trip (since it's not over yet! 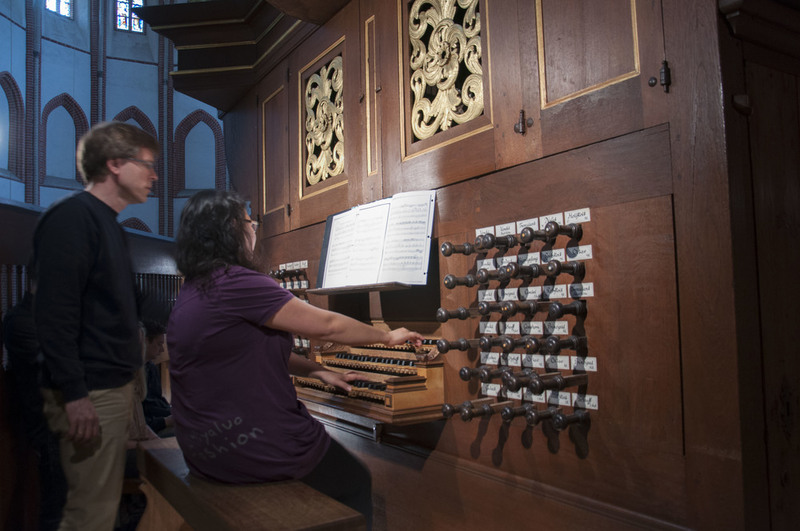 ), we did go around talking about our favorite instruments, since that morning's organ was our last. We also talked a lot about the Titanic. Not sure how that happened either. Gathered round at our Italian lunch! After lunch we embarked on our two hour drive to Bremen. I can't speak to what transpired on the journey in the black Mercedes because I was in the blue Ford, but I can't speak as to what transpired in the blue Ford either—I was asleep! Chris and Brandon went to return the rental vehicles to the airport while the rest of us moved into our hotel rooms and contemplated how we ought to spend our last evening together. After brief deliberation, a consensus was reached: we would take a twenty minute power nap, then explore the famous Altstadt (old city) of Bremen, which was centered around a delightful street named Schnoor. It was like stepping on to the set of a movie, with narrow streets and small buildings. I nearly expected a dwarf from German folklore to awkwardly pop out as we walked down the cobblestone. A typical building in Schnoor. We ate dinner outside at a restaurant about five minutes' walk from Schnoor, where Chris and Brandon met us. We sat underneath a lovely little glockenspiel, verdant with age. Jennifer and Gianmarco each ordered a dish that was meant for "1–2 people." These meals were really suitable for 3–4, given that the single-person portions were large enough for two. It wasn't until the waitress (bless her heart) brought out these enormous platters that they realized their mistake. The astonishment, nearly giving way to distress, was hilarious. As one might imagine, the dinner wore on for a good while, such that it was quite chilly by the time we left. I'm not sure how Gianmarco, Jennifer, Brandon, and Noel coped with it, but David, Laura, Chris, and I conquered the cold by holding footraces on the way. Laughing and smiling, we made our way back to the hotel. Gianmarco's huge dinner plate. Jennifer's was similarly sized. Dinner group photo, which would be our last for the trip. To properly end our incredible trip, we stayed up playing games and polishing off our remaining food and drink. Noel and Gianmarco, on behalf of all of us, presented Chris with a mug from the restaurant that night—there's more to that story, but you'll have to ask them. Exhausted but satisfied, we all went to bed with dreams of Germany dancing in our heads.